Fun and funky jewelry, pottery, mobiles, and book purses. Here, in the gallery, we carry several collections of jewelry that are all hand made by artists. Made of a mix of metals, leather and acrylic, all of the jewelry is both lightweight and hypo allergenic. Stop in and check them out and you are sure to find either a wonderful, inexpensive gift or a little treat for yourself! 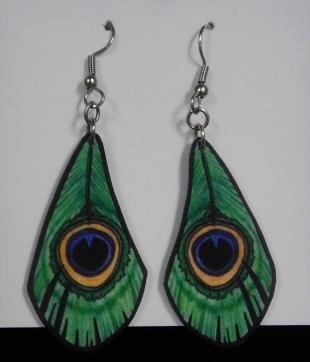 Green peacock feather earrings by Bird Queen Designs. 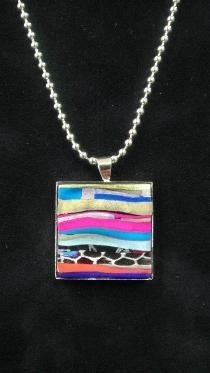 Modern art inspired, multi colored pendant in acrylics by Pinderella. 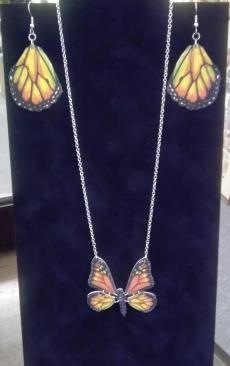 Butterfly necklace and earrings in acrylic by Bird Queen Designs. 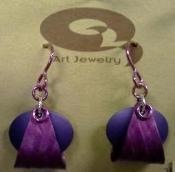 Two tone purple earrings in anodized aluminum by Q3 Art. 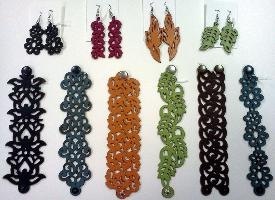 Colorful, light weight and comfortable hand dyed and cut leather earrings, cuffs and necklaces. 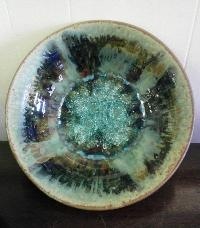 Gorgeous hand thrown pottery in hues of blue, teal and brown with sparkling, crackled glass center. 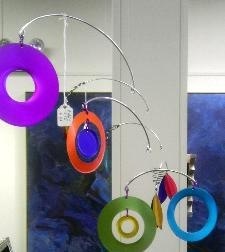 Hand made anodized aluminum hanging mobile. 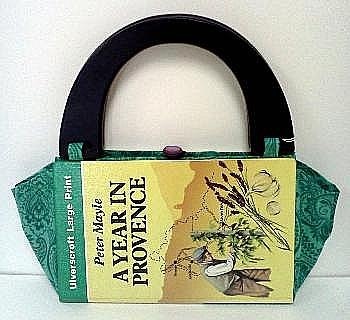 Hand made, fully lined book purses made from actual books by Suzabelle Designs. GREAT gifts!